Passions run high in the sanctions debate on Cuba, and everyone is entitled to their opinion but not their own set of facts. Below you will find sourced information regarding the U.S. Trade Embargo on Cuba with the objective of contributing to the ongoing debate and discussion. When one is reviewing any policy between those who advocate maintaining the status quo and those advocating scrapping it there is a third position that needs to be considered: "Does it serve the just interests of the United States?" For example when Jeffrey Goldberg cites the availability of American food products in one of the Cuban government shops for tourists, and says he doesn't know the "mechanism" of how it bypassed the American economic embargo" he is apparently unaware that President Bill Clinton shook hands with Fidel Castro in September of 2000 and a month later signed the Trade Sanctions Reform and Export Enhancement Act and opened cash and carry trade with the Castro dictatorship at the end of his Administration. At the time of its passage, Fidel Castro said "his country would not buy 'even a grain of rice' under the current terms." The Cuban dictator ended up buying much more than a grain of rice under those terms. 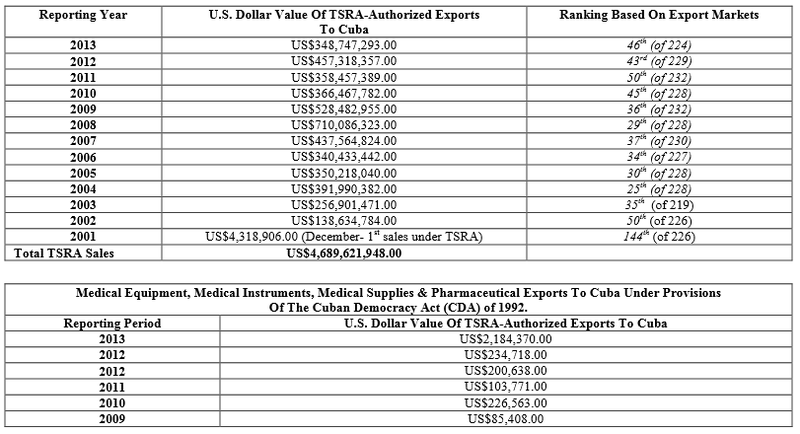 Between 2000 and 2013 American companies have sold $4.689 billion dollars in goods to the Castro regime on a cash and carry basis. Despite the 2003 crackdown on dissidents known as the Black Cuban Spring where the Bush Administration tightened sanctions on being able to travel to Cuba and set limits lower on remittances sent to the island. However, nothing was changed in the cash and carry sales made by U.S. companies to the Castro regime.Towards the end of the Bush Administration in August of 2008 the Cuban government announced that the United States was its fifth leading trading partner. Chart from the U.S..- Cuba Trade and Economic Council, Inc. The U.S. Chamber of Commerce in a February 2014 post cites a March 2010 study by Texas A&M University that claims that "easing restrictions on agricultural exports and lifting the travel ban could result in up to $365 million in additional sales of U.S. goods and create 6,000 new jobs in the United States." Its not the first time that such a claim has been made back in 2002 a group that advocated lifting the embargo, the Cuba Policy Foundation, produced a report claiming that the cost to farmers was up to $1.24 billion annually. Looking back today in 2014 the economic data raises an important question. Professor C. Parr Rosson who authored the 2002 study does a break down of trade through 2011 that demonstrates that the peak year of trade between Cuba and the United States was 2008. Despite further loosening of sanctions under the Obama Administration and a more conciliatory posture annual trade with the Castro regime dropped from the peak year of $710,086,323.00 in 2008 to $348,747,293.00 in 2013. Could it be that trade considerations by the Castro regime are subject first to political considerations? If so then what will trade look like when relations are normalized with Cuba and the United States no longer has the leverage of the trade embargo? Countries around the world that have "normal" trade relations with Cuba have had a different track record with the island. First on April 23, 2014 Moody's Investor Service downgraded Cuba's already poor credit rating to Caa2 from Caa1which Nasdaq defines as follows: "Obligations rated Caa2 are judged to be of poor standing and are subject to very high credit risk." Canadians have had to pursue Cuban maritime debts seizing Cuban vessels and negotiating payment through Canadian courts. This is not an isolated case. Russia, Venezuela, China, Japan, Spain, Argentina, France, Romania, Brazil, Italy, and Mexico are owed billions of dollars. Russia is forgiving $29 billion dollars of debt that the Castro regime owed it and Mexico is waiving 487 million dollars of debt owed it by the regime in Havana. All these countries have commercial relations with Cuba and extended the government credit. James Prevor, President and Editor in Chief of the publication Produce Business in October of 2002 in the article, Cuba Caution, reported on how Cuba "had exhausted all its credit lines and, at best, was simply rotating the accounts. When the opportunity came to buy from the United States, Cuba simply abandoned all those suppliers who supported the country for 40 years and began buying from us." The suppliers were not the ones impacted by Cuba's failure to pay its debts, the taxpayers of the suppliers' home countries were the one's left holding the tab. "since March 2009, a select group of commercial banks now will be able to offer terms of 180 days to five years on federally-guaranteed loans to the foreign buyers of U.S. exports without having to obtain prior federal approval. ... Because of the foreign risks involved in export lending, most commercial banks through-out the world do not make these loans without government guarantees. In the U.S., the guarantees are provided by the Export-Import Bank of the United States (Ex-Im Bank), a federal agency. But what the really big grain traders want is to sell to Cuba on credit - and get those credits provided or guaranteed by various federal loan programs. 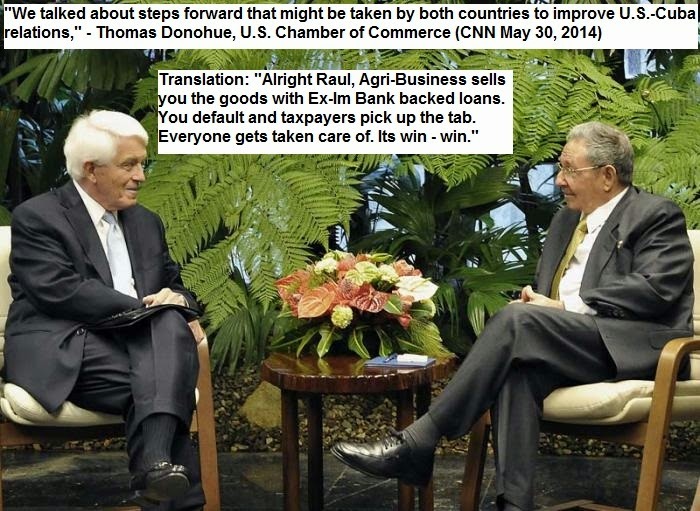 In effect, these agribusiness behemoths want to sell to Cuba and have the U.S. tax- payer pick up the tab. And their bet is that once produce shippers have gotten a taste of the business, they will become a kind of Amen corner for the Cuban lobby, pushing Congress to approve whatever laws will be to the liking of the Cuban government. This really brings to the forefront why trade with a communist country poses unique dangers to a democratic society. A policy of normalization with the current government in Cuba may be good for Agro-business, the US Chamber of Commerce, and the Castro regime but it will not be good for American taxpayers. Compared to the previous half century of public policy on Cuba the observation that things can go from bad to worse seems appropriate. Many claim the U.S. trade embargo is a failure but is that a fact? If the U.S. trade embargo has been a failure as the Boston Globe, and Jeffrey Goldberg have recently asserted and a failure that has been decades long as Daniel Griswold, then of the CATO Institute, argued in 2005 then why has it persisted? 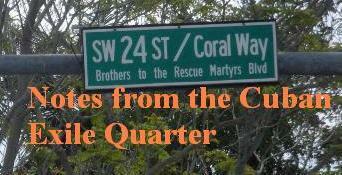 The usual explanation is the power of Cuban exiles in Miami but another explanation is that it hasn't been a failure and has achieved important objectives. Dr. Stephen Wilkinson of the International Institute for the Study of Cuba at London Metropolitan University argued in a 2008 paper that the "Cuban embargo is an example of a successful failure." The reality is that the trade embargo has not been static but has undergone changes over the past five decades under different Administrations and achieved important objectives. “We will not, of course, abandon the political, economic and other efforts of this hemisphere to halt subversion from Cuba, nor our purpose and hope that the Cuban people shall some day be truly free." Analysis: With the notable exception of the triumph of the Sandinista rebels in 1979 financed and backed by the Cubans, ( at a time when President Carter tried to normalize relations with the Cuban government ) the Castro regime's insurrections failed to succeed in the Americas and Soviet expenditures in Cuba were high but whether or not that contributed to its collapse is a subject for debate. Following the end of the Cold War and the collapse of the Soviet Union in 1991 the U.S. trade embargo was overhauled first in the Cuban Democracy Act of 1992. In 1996 in response to the February 24, 1996 Brothers to the Rescue shoot down as an alternative to military action on the Cuban government the Embargo was again overhauled and toughened in the The Cuban Liberty and Democratic Solidarity (Libertad) Act of 1996 but also spelled out how and under what conditions the Embargo would be ended. Trade with Cuba has not changed the Castro regime's hostility toward the United States or other democracies in the region. The example of Venezuela should be both instructive and a caution to those who, like Daniel Griswold claim that "Cuba does not pose a significant military threat to the U.S. or to other countries in the region” citing a report from the Defense Intelligence Agency that was written by Ana Belen Montes, a Cuban spy who did a lot of damage to American intelligence. By the time Venezuelans began to voice their concerns it was too late and the consequences for Venezuela have been and continue to be dire. Who do you think has more leverage in a negotiation? The country that has economic sanctions in place and 14 years of trade surpluses with Cuba as its fifth leading trading partner or one of the long line of countries that have loaned the Cuban government billions of dollars in loans that it has defaulted on?